“In a technology-enthused world, consumers are used to having things at the touch of their fingertips. Restaurants seem antiquated by comparison – but all that’s about to change,” says Rajat Suri, chief executive of the California-based tech company E La Carte, whose cutting-edge tablets are coming to restaurants and pubs in the UK soon and likely to arrive in Ireland shortly after. This is not as clinical as it sounds, apparently, as ‘personalised customer experiences’ play a big part in the future. Customer-recognition systems such as Cheerfy, already available in the UK, enable restaurants to connect with customers’ telephones via Wi-Fi the moment they walk through the door (as long as they’ve opted in). This alerts staff to the customer’s arrival and flags up information on the restaurant’s computer system based on data gathered on previous visits. “We want to deliver the same personal customer experience as you get online with services like Amazon, which knows who you are when you log in and anticipates purchases based on previous buying patterns,” says Cheerfy’s co-founder Adrian Maseda. One day, the data may even include your DNA profile, which will alert the kitchen to prepare a meal tailored to your genetic make-up. “You know that scene in the film Minority Report when Tom Cruise walks into Gap and a hologram does a retina scan, welcomes him back and asks how his last purchases worked out? That’s what we’re working towards,” Maseda says. And where there’s technology, there’s entertainment. Last year, Carluccio’s was the first restaurant group in Ireland to roll out virtual-reality (VR) dining: customers pulled on a headset and experienced the sights and sounds of Sicily as they tucked into their pasta. Augmented reality (AR) – where computer-generated 3D images and sounds are superimposed over actual surroundings – will enable customers to play visually astonishing games or view holograms of dishes on the table in front of them. “Dining out is becoming as much about the experience as it is the food,” says Mandy Saven, head of food, beverage and hospitality at trend forecaster Stylus. Neurogastronomy and multisensory dining – where mood and flavour are dramatically enhanced through the stimulation of all five senses – is another emerging area. 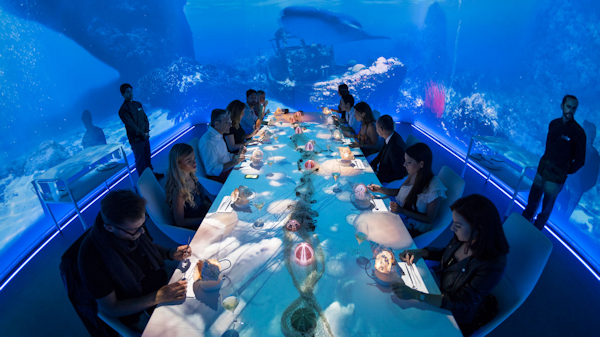 Shanghai’s Ultraviolet restaurant pairs its 20-course ‘avant-garde’ menu with lights, sounds, music, scents and projections. And Sublimotion in Ibiza, ‘a gastronomic performance experience’, serves up gastronomy, drama, music, art, design, technology, magic, illustration and neuroscience in one meal. Virtual taste may also be on the way: customers could one day be able to use electrodes or LED lights to stimulate the flavour experience. “The notion of digital taste is still in its infancy, but it is a space to watch,” Saven says. Of course, if you can’t be bothered to go out, ordering in will be an experience too. Food-delivery firm Just Eat is currently testing delivery droids in three areas of London, and plans to roll out the pavement robots across the city later this year. Meanwhile, Domino’s is working on expanding pizza deliveries by drone after a successful maiden voyage in New Zealand last year. And disposing of the pizza box won’t be a problem: all packaging will be edible or compostable within a decade, according to food-trends forecaster Dr Morgaine Gaye. The future will be all about making it easy for hungry people to order food wherever they are, says Andy White, Just Eat’s senior technical manager for product research. This means that voice-activated ordering while watching TV or gaming on the Xbox will become streamlined and more commonplace. “It’s important for us to have a presence wherever our customers are spending time,” White says. It’s all a long way from trudging up to the high street for a Chinese. And who knows where else food of the future will boldly go?